Through this first HCNSO Ocean Research Jamboree (May 19-20, 2016), NSU marine scientists will highlight current ocean science research projects currently ongoing at the Guy Harvey Oceanographic Center and Halmos College Of Natural Sciences and Oceanography. Faculty, postdocs and graduate students will present technical summaries of current research that covers a wide array of diverse marine topics: physical oceanography, coral reefs, larval ecology, bill fish, shark tracking, marine genomics, marine diseases, invertebrate physiology, evolution etc. 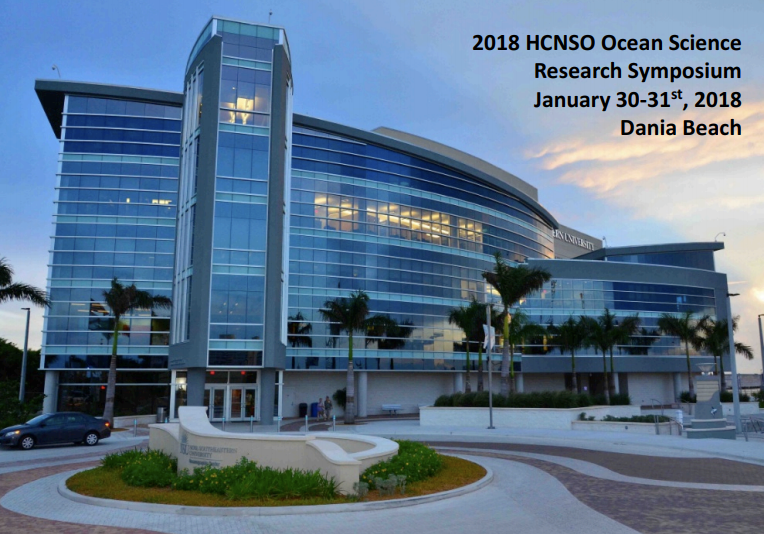 Through this second HCNSO Ocean Sciences Research Symposium (Formerly OC Jamboree (Jan 30-31, 2018), NSU marine scientists will highlight current ocean science research projects currently ongoing at the Guy Harvey Oceanographic Center and Halmos College Of Natural Sciences and Oceanography. Faculty, postdocs and graduate students will present technical summaries of current research that covers a wide array of diverse marine topics: physical oceanography, coral reefs, larval ecology, bill fish, shark tracking, marine genomics, microorganisms, marine diseases, invertebrate physiology, evolution etc.